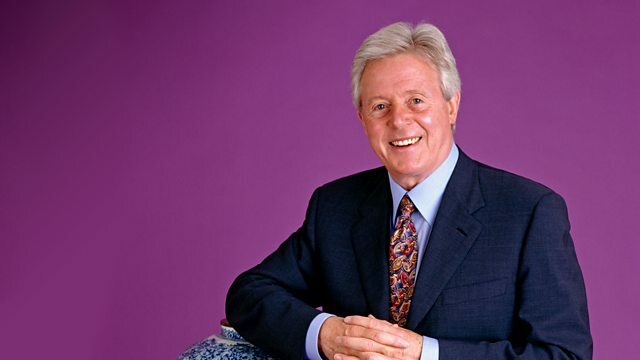 Michael Aspel takes the roadshow to Abergavenny in Wales. Treasures include a copy of a James Bond book bought for 50 pence and a valuable 17th-century spoon. Browse content similar to Abergavenny. Check below for episodes and series from the same categories and more! and where voices raised in harmony still echo through the valleys. We're at the gateway to Wales - Abergavenny. There's been a settlement here for 6,000 years. The Romans named it Gobannium. But with the Norman Conquest, a castle was built and the town of Abergavenny established. The Normans never trusted the Welsh, and the Welsh returned the compliment. the Ogre of Abergavenny, invited local nobles for Christmas dinner at the castle. the best men of Gwent - were hacked to death. The resulting vendetta went on for years. of any parish church in Britain. include the volcanic shaped Sugar Loaf and the Holy Mountain, or Skirrid Fawr. and 900 years ago, a sheep rustler named John Crowther breathed his last, dangling from this beam. His death kicked off a grim tradition. Over the years, no less than 180 unfortunates died in this stairwell. the beam was so fully employed that the dragmarks of the rope can still be seen. 1952 is a year Abergavenny and Wales will never forget. and the showjumping team of Foxhunter and Harry Llewellyn. but 16 years later he won Olympic Gold. Foxhunter's memorial and Harry's ashes lie at the top of Blorenge Hill. Today's venue is Abergavenny Leisure Centre. The show is about to begin, so please take your seats. because he disliked him so much. On one occasion the brolly came out and fell on the floor. and it's very slightly dented on the outside. -shortly after World War II. -I wonder what he paid for it? He might have paid more, and didn't want to tell my mother. Supposing he might have paid £20, it still wasn't a huge amount of money. In the post-war era, things Japanese were really not particularly appreciated. no longer made armour in the quantities that they had previously. using all their metalworking skills. This particular piece is by a man called Miyao. -It's signed on the leg, here. and it is just wonderful, wonderful quality. and here you've got a chap with an ape on his shoulder and a parasol. the chrysanthemum is the national flower, and so on. you could expect it to make somewhere between £4,000 and £6,000. So, you know, a jolly useful investment by your father. So, are you telling me you got all these from car boot sales? -Why do you like Ian Fleming? and then after that, I started to look at the writing of Ian Fleming. When I bought this book here, about... I think that was about three years ago. -and that is what I wanted to know. -That's what you want to know. -Well, James Bond was an American ornithologist. He wrote a field guide to the birds of the West Indies. -and he'd read James Bond's book. In a way what he did was, he just grabbed his name and he used it. and so this is a collector's item in its own right, because of the connection. -I didn't, I didn't realise that. The unusual thing about the whole collection is that most of them are in just such beautiful condition. and the damp comes through like... There's one or two. That one there. -The edge went because it was in a damp box. -Yes, you can see there's a bit of damage, and that makes a crucial amount of difference. This WOULD have been worth a few hundred, and it's probably reduced it to more like two or three. -With the damage on the edges, here. Dr No is another very good one, which is now worth £300 or £400. we've probably got in excess of £2,000 worth. -Do you know, this is the first book he ever wrote? Casino Royale has a tremendous premium. -This is the book that, in a way, launched his career. And it was published in, er, 1953. If I said it was worth a few hundred pounds, would you be surprised? -What about if I said it was worth a few thousand pounds? -I would be a bit shocked. -You would be a little bit shocked? And if I said to you that recently it's been fetching between £5,000 and £7,000 at auction? -And you say you bought it at a boot sale. -Do you remember how much you paid for it? Most of the books cost between 50p and £1. Well, there's a return for you. I inherited it from my old grandfather. "When I'm gone,"
-he said, "this will be for you. It'll be yours". It's always been appealing. I think it's got a sentimental sort of effect. -I think that is the appeal. -All being looked at and looked after. The old cabbage leaf appealed to me because it's so natural, you know. -The artist is Robert Morley. And you can see the date of the picture there in the far corner. This was painted when he was in his early 30s. It could do with a jolly good clean! Where have you been keeping it? A smoky room, or over a fireplace? No, we haven't touched it. No. My wife would like to have it repaired and renovated and cleaned. which has been repaired and as if something had happened. -A picture like this, in its original frame, should actually have an original label on the back. -which, of course, is "The Foster Mother". And it's also got the price which he asked for the painting, which was 31 pounds and 10 shillings. -Quite a lot of money at the time. with this tear, it would have to be relined as well. -And that would obviously incur considerable costs. and I would have thought that something like £2,000 or £3,000. If it was well restored, probably £3,000 to £4,000 or £5,000 for insurance would be the right figure. -Where did this come from? My great uncle was in the Navy, so he travelled the world. -Did he get to Ireland, do you know? -Not that I know of. as obviously you'll appreciate, and this is Irish. which I can claim no knowledge of whatsoever, but apparently it's extremely rare. it's supposed to be octagonal, but in fact it's slightly off shape. Which I think gives it great character. When you hold it, you can sort of feel that. Let's have a look at the caddy itself. and again on the lid, there. is that there's no maker's mark. This is what the Irish often did. and if they put a maker's mark on, they left off the date letter. Dublin date letter there, the "E" of 1825.
for that sort of date as well, in Ireland. So, to have those two coming down together like that is really quite something. Had you thought in terms of value? I took it to the Roadshow in Merthyr. That was 13 years ago. -And it was valued then, I think at around £200. -Yes, I think we need to rethink that. Irish silver has become highly sought after in the intervening period. That box alone is worth in excess of £500 without the caddy. -A couple of thousand pounds. it's got to be in excess of £3,000. -You've made me very happy. -In fact, I would be insuring it for nearer five. -So, that's not bad news. it's one of the most politically incorrect clocks I've ever seen. Um, it was given to my parents in the '50s. "Peace in our time". He came back waving a piece of paper. In that week they made two of these, and this is one of them. The other one is supposed to be in a museum in Birmingham. We haven't been able to locate it. -It's possibly buried in the vaults. -Goodness me. Value... I haven't got a clue. -I'll give a number, I think it's fascinating, I think it'll be £500. Hey presto, the settee table. -Leatherette seats. Are they comfortable? I think there's someone in here, trapped. What does a respectable lady like you do with six decanters? I look at them occasionally, and just wish that they were all full. -Well, could you not fill them up? That's what they're made for. These were made in Spain, at a place called La Granja, in about 1790. And it would appear that the box was made for them in England. -Still in the Georgian era. -I think it would be worth between £2,000 and £3,000. -Do you know what date the table is? -I have been... Somebody told me it was William IV. so this type of carving would be very popular. or was the carving added later as a bit of decoration? Let's see if there are any clues on the back at all. The top is a different colour, this whole surface, to the sides. if the edge was recarved. So there's no original patination of dirty fingermarks going under the table. Had there have been, it might have suggested that perhaps, amazingly, this Rococo decoration was original. -It certainly did happen, but not on a plain piece. -So, the Victorians got at it? -but only... It's only 1830 anyway. -Have you had it a long time? -Is it a family piece? -It was bought by my parents in 1945. I've no idea what they paid for it. But look at the size of it! I mean, how many people can you seat at that? but that's comfortable. 20 is fine, and 24 you can squeeze in. -At a pinch, at Christmas. -Yes, and... We use it fully out a lot. -But if there are just two of you, you need a railway, do you? You just put these bits together, and you've got a nice square table. Right. This is how you see it in a catalogue or a saleroom, isn't it? It's rather nice, complete with dust and everything. and pine there. They're economising, not using the solid mahogany. -But it has been repolished. -And we have to say that it's been recarved on the edge. Have you got it insured at all? -Yes, it's insured for ten thousand. So, could you replace...? I'm trying to sort of think of a logic here. Could you replace it for £10,000? I think you've got to put a bit more on that. I think I'd say £15,000. Insurance DOES go out of date. because to go out and buy a 22 or 24-seater dining table, £15,000. Geoffrey, people bring you things to see. Suppose they've dug them up? That's the most exciting way to find things, possibly. -with an inscription round it. It's actually 14th century. It was found in 1760. Its discovery was reported to the Society of Antiquaries that year. -are turning up in quite large quantities. -So, what must you do if you find something like this? The thing to do is to be careful. You've suddenly stumbled into an immensely complex environment. who will decide whether there are any rights to this jewel beyond your own. And if they have established those rights, who gets what and when? Well, if the object is of sufficient importance, certainly you will get some financial reward for it. but if it is, a museum will get it. It used to be called "treasure trove". It is something to beware of, for all people using metal detectors today. Join a society where there is some advice given to you there. but there is something that you can discover on the website. for the pitfalls in finding things. I wish I could keep this. So, why does a man of your age have a doll's house? I'd just seen it, and fell in love with it. Well, I just think it's the most terrific doll's house. and I think it really epitomises the time in which it was made. and it actually looks like quite a surburban door, but very stylised for that 1920s period. with these very stylish Deco-looking porthole windows. when you then look at the complete scale of it. -Wow, it's certainly in what an estate agent would call "original condition", isn't it? It doesn't look as if anything's happened to it, in fact, since it must have first been made. -Can you explain what this is? -It's a lift to all the floors. It originally worked by battery - there's electrics at the back. -The lift is in the bottom and I think you pull the string there. Gosh, and what looks like an incredibly sort of Art Nouveau lift is in this shaft in the middle. -And there's also rooms in the attic. -Let's have a look at those. -Gosh, and all this panelling! Someone's gone to considerable trouble with it. but when you see this rather gabled, um, hipped roof, it looks slightly more Dutch. to a lift in a hotel, or something. -This is probably my favourite room, in fact - the nursery. called Henrietta Willebeek Le Mair. -it just makes me wonder even more if this is. -Do you think it's Dutch? -and I think the combination of that and these Dutch illustrator's pictures, yes. When you bought it, what were you told about it? Originally, they sold all the fittings off, and it's been left in a garage for 10 or 20 years. That's the greatest tragedy, really. -has actually not got any of the original fittings. I can see it fetching up to the £1,000 mark. I'm sorry - I don't know anything about it. I bought it in an auction in Colwyn Bay six weeks ago. -So I'm the first mug in, in a sense. -You're the first to see it. Well, the basic concept here is what we call a sun and moon watch. They go back into the 17th century, even possibly earlier than that. so that the hand goes round once an hour. and the moon comes up at six o'clock in the evening and goes down at six o'clock in the morning, backwards. I'm going to pull it apart, if you don't mind. I promise I'll be able to put it back together again. Not advisable. I should put a sign up, shouldn't I? "Dangerous. Don't try this at home". Right. Well, that is the first point here, if we look. If we start with 6 dots, 7 dots, 8 dots, 9, 10, 11, 12. -So it must run backwards. they inlaid some steel, and the steel is polished and blued. whereas this watch is obviously considerably later. -Now, I've got a maker's name on it. And it says "Number 1, 1815". If you've looked at the engraving it's really very crude, isn't it? -It's not good quality compared to the watches of this period. -they were done by out-workers. but they were very skilled and they worked to very accurate patterns, particular designs. This is really somewhat wayward, all over the place. -I would say that it was therefore done by the man himself. so I think he is a completely local watchmaker. so you can see through to the balance, but it gets worse! Or better, as you might say. ..and a barrel and a chain. and then off that barrel, being wound onto the fusee. -cos you've got two main springs pulling on one thing. My guess is that it would probably go for more than the usual 30 hours. so it probably goes for 8 days. and he's created a complete watch around it. is that every time you add an extra wheel in a train of wheels, it goes the other way. or whatever the duration is, and ended up with it going backwards. He hasn't been put off at all - he's simply engraved the dial backwards. It must have been made for himself. 1815 is also the date on the case - there's a hallmark. It's not just put together out of bits he's found - a lot of work's gone into it. -Extraordinary. You think you've seen everything, then this turns up. I'm going to ask you an embarrassing question now - what did you pay? I paid £600 approximately, altogether. Oh, I think that's all right. I mean country sales are not always bargains by any means. I would say that's worth £1,000 of anybody's money. It's quite an extraordinary object. Are you any the wiser? Well, it's unusual, I mean, I thought it was unusual when I saw it. -Great. Well, I admire your courage. Thank you very much. -It's a carbide lamp, used underground. -And did you ever use this one? -How on earth do you use it, then? -Pull the top off, fill it full of carbide. -Would you have a supply of that with you? -Yes, yes, keep the carbide in a tin. Water goes in there. Turn the tap on then and it'll drip. Water dripping onto the carbide, and that forms the gas. Light it there... Of course, the reflector's missing off there. -And how long would it last? -Then you'd fill it up again? -There can't be many still left in miners' hands. -It belonged to my grandfather. -He done 50 years in the Miriam Colliery in Ebbw Vale. -Then he survived the explosion in 1926, of course. -Commercially, then, it doesn't matter what it's worth. -Worth more than that to me. and looks as though it's the handle to a very short cane. What's in the bottom, here? It's stamped "Vickery". That's a good firm of makers based in London. Oh, my goodness. Right, so it's a parasol. Silk can be quite fragile, but look at that. What a beautiful shape. -Dates from probably around the 1920s, and I would value it at £200 to £300. Now, how did you come by this bit of Sung porcelain? either in Ho Chi Minh Ville or Phnom Penh, but I think probably Phnom Penh. -Was it called Ho Chi Minh Ville then, already? -Or Ho Chi Minh City, really. -Yes, Ho Chi Minh City. the whole of Cambodia was a Chinese province. Anam, I think the whole thing was called. But this doesn't come from there. This is a metropolitan piece. which have a very beautiful porcelain. -and it's really beautiful creamy and white, the actual ware. I'm perplexed by this stuff. I think it would come off, but you haven't tried to remove it. -I don't think that's fired in. holding the pattern of the glaze. -And it's a classic piece - it's 800 years old. This is one of the earliest... The earliest white porcelains you get. -It has got a little problem, not too serious. but there you have something that's 800 years old. Did you pay a lot for it? I very much doubt that we paid more than between 20 and 30 dollars. more stuff has become available. -I think it's worth between £2,000 and £3,000. -I think you're very lucky. -Lucky, yes. I'm not sure about skill or cleverness. We inherited it from my husband's uncle about fifteen years ago. Yes. And you have a little boy that goes with that? -and the Princess Royal as children. The little girl that we have here is the eldest child of Queen Victoria. the little boy that you have, went on to become King Edward VII. and went on to become the mother of Kaiser Bill. -In the First World War. So, they're a very interesting historical pair. -Which is what she is. -As you can see she's got a flat back. -So she would have sat on a chimney piece, as an ornament, she and her brother. And the lovely thing about her is that the pottery is so white. -which you don't really think of as a Victorian colour. -And the other one's in good condition? -could go for as much as £2,000, even £2,500. I'm a jewelaholic really, yes. I never pass a jeweller's. I look in every jeweller's that I come across when I'm out shopping. -Who's gives them to you? -Look at this. Did he give you that one? -He gave me that one, yes. He purchased that about four or five years ago. He gave it me then for Christmas and birthday. Ah, and what do you know about it? Tell me what you think. Well, I only know that I think it might be Art Deco - is it so? It is Art Deco without doubt, yeah. Very geometric. -Looks for all the world like an Odeon cinema. because what we're really looking for is art and design boiled down. and there are two rather interesting things about the diamonds. One is the fantastic purity of them, they're very white and quite clean. There are very very few inclusions, which is wonderful, but we can tell that they've been reused. Bricks from an older house have been put in here. A house that was built about 1860. The techniques of cutting diamonds have changed over the years, and these are 19th century diamonds. -and built an Art Deco house. It's a brilliant house, isn't it, if we extend the metaphor? -Lovely thing. Do you wear it? -I wear it regularly if I'm going out. Did he tell you how much he paid for it? -Did he? Come on, are you going to whisper? to give to somebody who loves you, I think that's a fabulous sum. I think 50% more for insurance, without any doubt at all. Say £6,000, maybe £7,000, for insurance. They're very beautiful diamonds. Well, this is a watercolour by an artist I know well. In fact, I could say I've known this artist most of my life. He was born in Newcastle, as I was, and it's John Atkinson. Do you know its title? -Does it have a title? -No, I don't think it does, no. -It looks like "The Morning Ride". -That kind of thing, doesn't it? -Actually, I think it might be Rotten Row in London. -In London, I wondered, I wondered that. -Possibly. That's the most I know about it. Yes. That makes it interesting, because he's a Newcastle artist. He worked in Northumberland, County Durham and Yorkshire. John Atkinson was a lovely artist. though there's body colour added. -You see the white heightening he's used here? Yes, and what I like about this is particularly the sense of movement. -The feeling of those riders. They're moving, aren't they? It's got a feeling of action about it. I also like the dappled light, the sun coming in through the trees. It's interesting being in London, because he didn't come to London much, didn't work in London. -and you should insure it for £5,000. So, we move on now to something completely different. A snowy landscape with a rather smartly dressed lady there. Now, this is by a French artist. -Called Georges Croegaert, and it's signed here. I think it's a delightful little landscape. It's beautifully observed. It really does have a feeling of snow and cold and winter about it. It's a delightful little picture, got a lot of atmosphere. who was famous for one thing, and that's for painting Cardinals in red robes. and disporting themselves in an un-Cardinal-like manner. that he can do something different, and paint landscape. He's clearly painted a real landscape here. Somewhere outside Paris, I would imagine. That's worth more than the Atkinson. -I would value that now at £10,000 to £15,000. Yes, I would. So, two very different but very delightful pictures. Yes. It's my grandmother's, who died when she was 103. "That spoon, my girl, will be handed down to the youngest girl". That's rather nice. The spoon itself is what's known as a trefid spoon. -A trefid... See how it's got these three sections at the top? -Yeah, so that's where the name comes from. -Those date principally from about 1660 through to about 1700. You get the plain, ordinary ones. This one's rather more special - it's a laceback. -but we've got this most wonderful lace-like decoration on the back of the bowl. is because the French put spoons like that on the table. -Oh, yes, now that is interesting. -which is why they called them table spoons. Because they were set in the French way, that's why they're decorated and initialled on the back. Can I just ask you what the initials mean at the back, there? -so we've got AB at the top and then WN underneath. -AB at the top would be the husband, and WN I would expect to be the wife. -And then 1699, that would be when they got married. -Almost certainly, that's what those will represent. this is a provincial spoon, and it's by Richard Sweet of Chard. That makes it quite a rare spoon. He's repeated his mark to make it look like a set of hallmarks. -Have you ever thought of value on this? -because my mother used to dish up greens with it. -It was used, she didn't know the value of it. Well, it's survived jolly well, and condition is important here. to sell in excess of £2,000. and they go, "Oh," and I think that is the best news I have had. I am SO pleased we came, and Ian, you are wonderful. Have I got time to tell you about my grandmother? Yes, quickly. She died when she was 103, and she wasn't a very nice person. Very Victorian. -She used to tell me to walk along with a bustle on my back. and I didn't think she was very nice to her children. So when she died at 103, I didn't go to the funeral. When my mother told me she was dead, I said, "Are you sure? Go up and check". Anyway, funeral. No, I wouldn't go. and somebody told me they had to push the button three times before the coffin would go. Ah, right - she was obviously reluctant to go. -She was one of those, but God bless her. Well, in a town that's nearly 1,000 years old, you would expect interesting items. I'm sure my Auntie Phoebe had one of these. I'll just sit here for a while. Until the next time, from Abergavenny - goodbye. Michael Aspel takes the roadshow to Abergavenny in Wales. Treasures include a copy of a James Bond book bought for 50 pence, an art deco dolls house, and a 17th-century spoon worth £2,000.